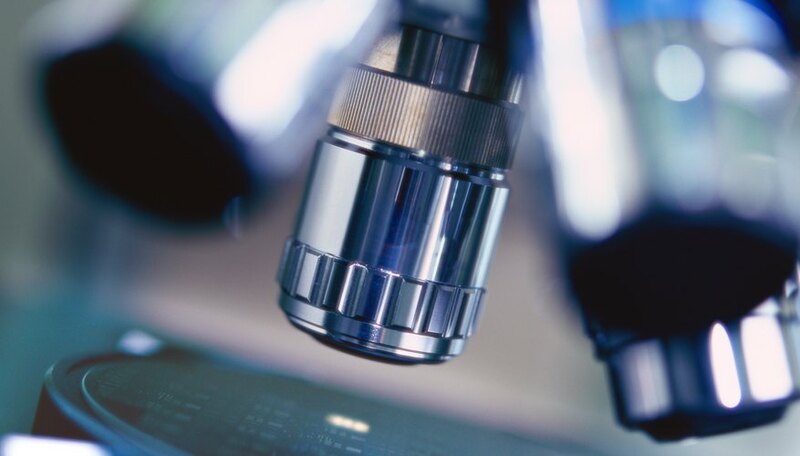 While certain microscopes are remarkably complex machines that require advanced training to operate, many microscopes are easy to use and allow you to perform simple, yet fascinating experiments. With a standard compound light microscope you can observe microorganisms and the smallest components of objects without having to undergo any type of training. Opening a container of plain yogurt that has active cultures. Scoop a very small amount of yogurt from the container and place it on the center of a clean slide. Add one drop of distilled water to the yogurt and cover it with a coverslip. Set the microscope at low power and look for a place in the sample where the yogurt is thin. Switch to high power and observe the bacteria. Record what you find with descriptions and drawings. Then, set the container in a warm, dark place for 24 hours. Afterward, repeat the process and see which new kinds of bacteria have arrived. Record your findings and compare them to your results from the previous day. Collect samples of pond water. You can take samples from different parts of one pond -- i.e. near the bank and out in deeper water -- or from different ponds. Prepare a chamber on a clean slide: Place one to three layers of electricians tape on a slide, and then score a one centimeter by one centimeter square from the center of the tape. This chamber will keep any microorganisms from getting crushed. Place a drop of water from one sample into the chamber and cover it with a coverslip. Observe it on several power settings and record what you observe. Then, prepare a new chambered slide for each additional sample and observe those. Afterward, you can compare your results. Cut off a small portion from a feather that includes a piece of its central stem. Place the sample onto a clean slide, and fix the coverslip to the slide by taping the edges. This dry mount will give you a clearer image of the feather than if you used a wet mount. Start with 25 percent magnification and observe that the branches or barbs attached to the main stem have little branches themselves. Increase the magnification and observe that these smaller barbules extend and overlap with barbules on adjacent barbs, which prevents large amounts of air from passing through the feather. This overlap allows feathers to contain air for flight. Slice a very thin piece of skin from an onion and place it on the center of a clean slide. Add one drop of water and the coverslip and then observe the onion on each level of magnification. Then, prepare a mixture of salt water. Carefully use a pair of tweezers to remove the onion from the slide and place it in the salt water for 15 to 20 minutes. Once again, mount the onion onto a clean slide. You won't need to add water because the onion is already wet. Apply a coverslip and observe the onion at different levels of magnification. Note any changes in its appearance after absorbing salt water. Cascio, Christopher. "Simple Microscope Experiments." Sciencing, https://sciencing.com/simple-microscope-experiments-12469.html. 25 April 2017.